Welcome to Wytheville, the Hub Of Southwest Virginia. Also called the Crossroads of the Blue Ridge, Wytheville has made its’ name on the map not only for being “that town where I got gas”, but also because of some major manufacturing plants. Pepsi, Gatorade, Longwood Elastomers, Camrett Logistics, Somic America, and many more plants comprise a lot of the business in the area. Tourism is also prevalent, as the Department of Museums and the Town Of Wytheville have been renovating many historical buildings in the area. 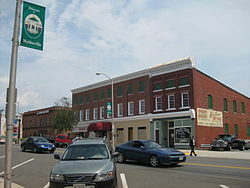 Wytheville hosts many events during the year. The Chataqua Festival In The Park is always the second week/end in June. Live music every night, entertainers, craft shows, photography contests, and much more pull huge crowds in every year. Withers Park holds a summer concnert series as well as the Relay For Life event. The Lions Club Carnival on the Wythe County Community College Campus draws a big crowd, and there are many flea markets and car shows in the area during the summer. The town has several schools as well as a community college within its town limits. George Wythe High School is known for their football and wrestling teams. Wythe County Community College has a stellar nursing program, as well as many other academic and technical programs. Wytheville boasts numerous shopping centers with everything from PetCo and Walmart to Tractor Supply and Lowes. Main Street is full of “Mom & Pop” shops and restaurants, including a large indoor antique mall. Graze On Main, Skeeters, Moon Dog Brick Oven, The Log House, Grayson’s, and VA Heights are locally renound restaurants.